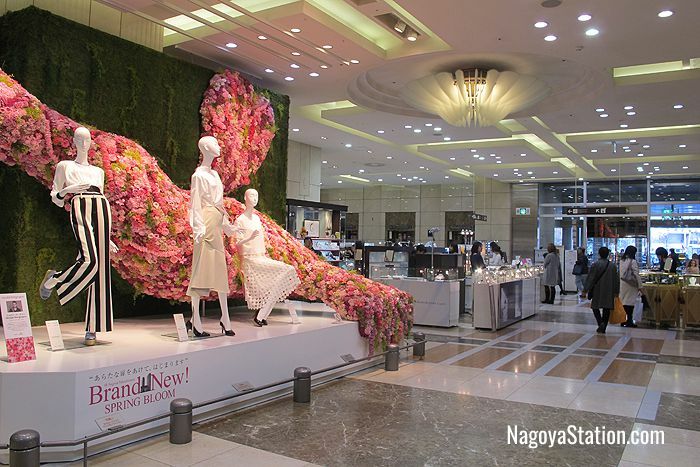 Nagoya has a great range of department stores, underground malls, and shopping streets. 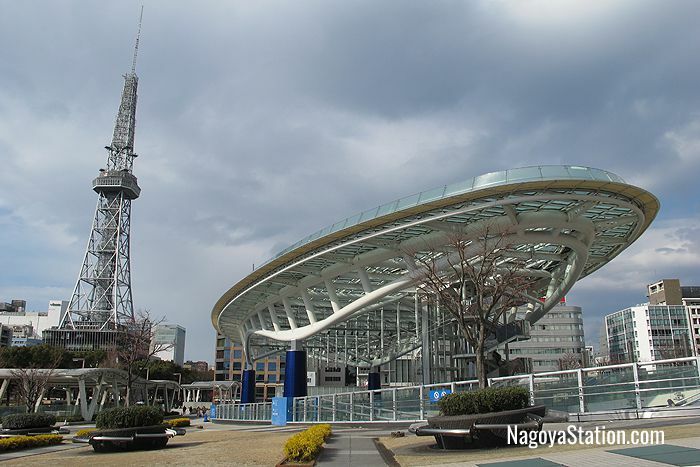 The main shopping areas in Nagoya are concentrated around Nagoya Station and in the Sakae central business district. 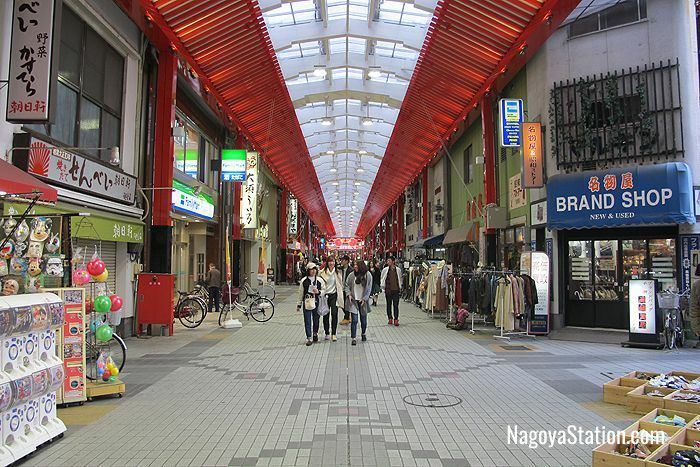 However, the shopping arcades by Osu Kannon Temple are also very popular. In this article we list the highlights of each area. 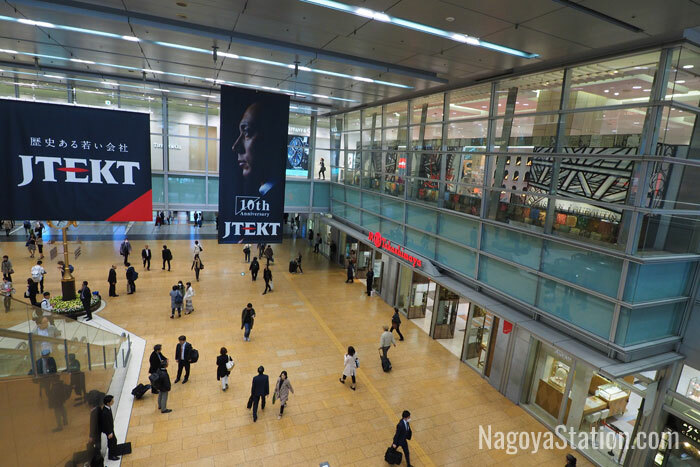 The Takashimaya department store is located on the east side of Nagoya Station and occupies the JR Central Towers building from the B2 basement level to the 13th floor. Here you can find big international brands like Tiffany, Gucci, and Prada and several floors of fashion, accessories, and cosmetics. On the 4th floor you can find a branch of the Tokyu Hands lifestyle store. Local souvenirs such as handicrafts on the 11th floor, and local culinary specialties in the basement food market are also well represented. The 12th and 13th floors are a restaurant area with a range of Japanese and international cuisines. Takashimaya also has a “Panorama Salon” on the 52nd floor which has a massage salon, beauty salon, café, and restaurant. This floor can be accessed by elevator from the 12th or 13th floor. There are tax refund counters on the 1st and 3rd floors. Multilingual PDF guides to the store can be downloaded from the official Takashimaya website. Opening Hours: 10.00 – 20.00. Esca is an underground shopping center which you can access via stairwells just outside the Taiko-Dori Exit on the west side of Nagoya Station. Of the 80 businesses here, 30 are restaurants serving Nagoya’s most famous specialty foods. Among the other businesses are stores selling confectionary, clothing, shoes, accessories, manga and anime related goods, souvenirs, and gifts. 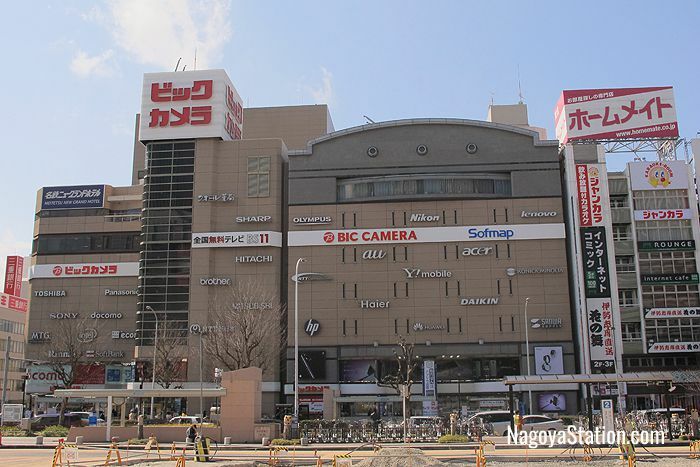 This center also has branches of Uniqlo and the Matusmoto Kiyoshi drug store. Closed: January 1st, the 3rd Thursday in February, and the 2nd Thursday in September. Bic Camera is the place to come for cheap electronics. This store has one basement and five upper floors of electronic appliances, computers, clocks and watches, toys and games, sporting goods, TV and audio systems, and cameras. There is also a drugstore on the ground floor, a bedding section on the 5th floor, and a liquor store in the basement selling wines, spirits, sake, and beer. You can find this store across the road from the Taiko-Dori Exit on the west side of Nagoya Station. 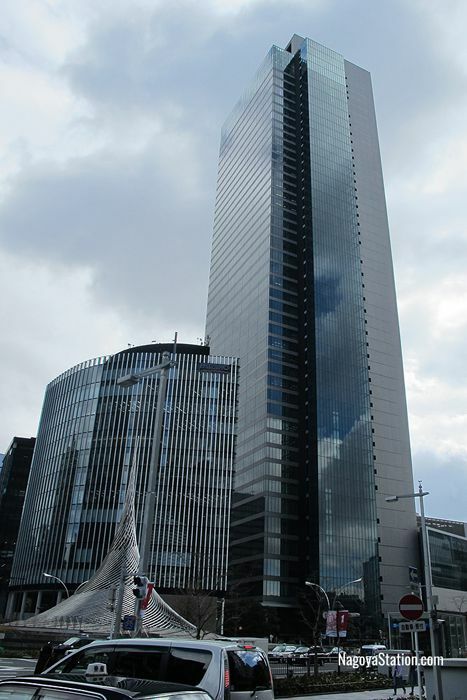 Midland Square is a shopping complex attached to the Toyota Mainichi Building, which at 247 meters high is the tallest skyscraper in Nagoya. Inside Midland Square are luxury brand boutiques such as Cartier,	Dior, and Louis Vuitton; Lexus and Toyota automobile showrooms; and a 5th floor cinema. There are also restaurants on the 41st and 42nd floors of the skyscraper, and an open air observatory called the Sky Promenade on the 45th to 46th floors. This is the highest outdoor observatory in Japan. Midland Square is a 5 minute walk from the Sakura-Dori Exit on the east side of Nagoya Station. 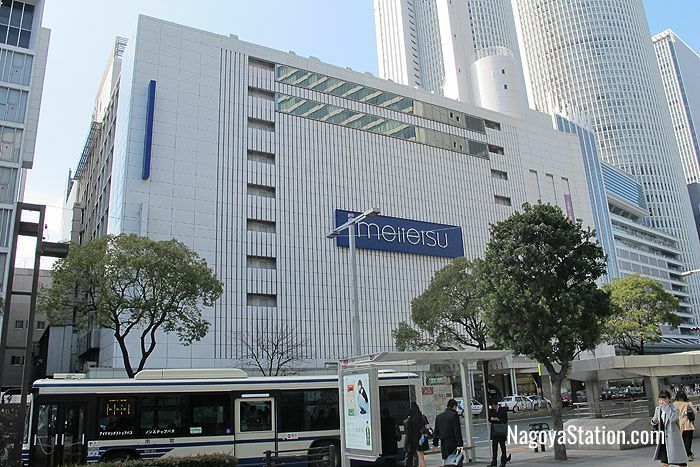 There are actually two Meitetsu stores, the main store above Meitetsu Nagoya Station and the “Men’s Building” which is on the other side of the Kintetsu department store. The main building has ladies fashions, cosmetics, and children’s clothes. There is a gourmet dining section on the 9th floor, and a summertime beer garden on the roof. The Men’s Building stocks men’s fashions, and also has a branch of Muji, the Loft lifestyle store, and the Kojistusanso hiking goods store. There are tax-refund counters on the 2nd and 8th floors of the main Meitetsu building. This Kintetsu department store stands above Kintetsu Nagoya Station and is sandwiched between the two Meitetsu buildings on either side. 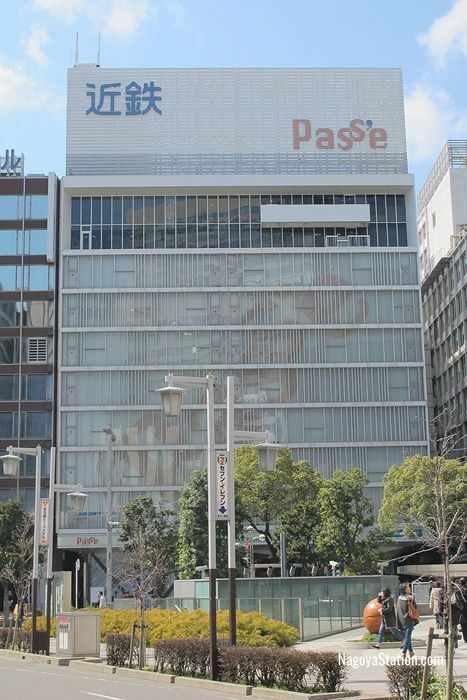 Kintetsu Pass’e stocks mainly fashions for young girls in their teens and early 20s, but also has a prepared food section in the basement and a branch of Tower Records on the 9th Floor. Etude House cosmetics are on the 3rd floor, and a there is a fragrance store on the 7th floor. Oasis 21 is a commercial complex which is directly connected to Sakae Subway Station. Most of the facilities are below ground but there is a large glass roof called “Spaceship Aqua” that floats above it. Water flows through this roof in order to keep the complex cool, and also because it is nice to look at. Inside the complex is a bus terminal, and a large open space called the “Galaxy Plaza” which is used for various events including musical performances, exhibitions, workshops, and an organic farmers market which is held every Saturday. There is table seating here and the plaza is surrounded by shops, cafes, and restaurants. You can find a number of fashion boutiques here, as well as an interior goods store, a Ghibli character store, a Shonen Jump manga goods store, and a Tourist Information Center. On ground level the complex is surrounded by a large grassy lawn. 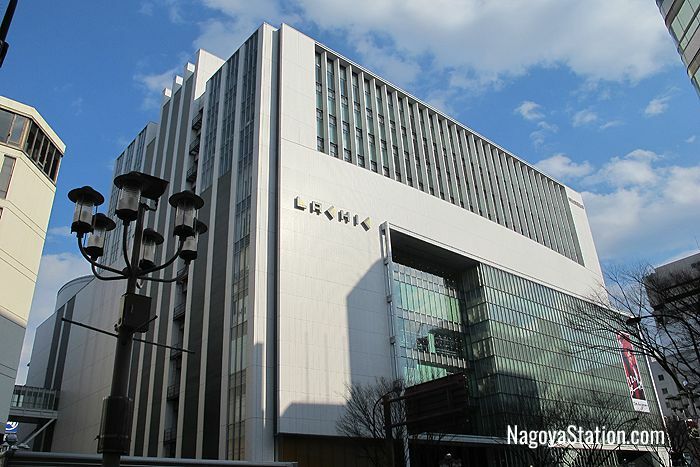 Just six minutes’ walk from Sakae Subway Station, Lachic is a stylish department store with 8 floors of youth-orientated contemporary fashion, accessories, cosmetics, and household goods. Here you can find popular brands such as Comme des Garcons, Margaret Howell, and Dolce & Gabbana. The 8th floor is a gourmet section with Japanese, Chinese, and Italian dining options. Look for the tax-free sign in individual stores and claim your tax back with each purchase. Matsuzakaya is one of the world’s oldest department stores. The company started out as a kimono and lacquerware wholesale store which was established in Nagoya in 1611. 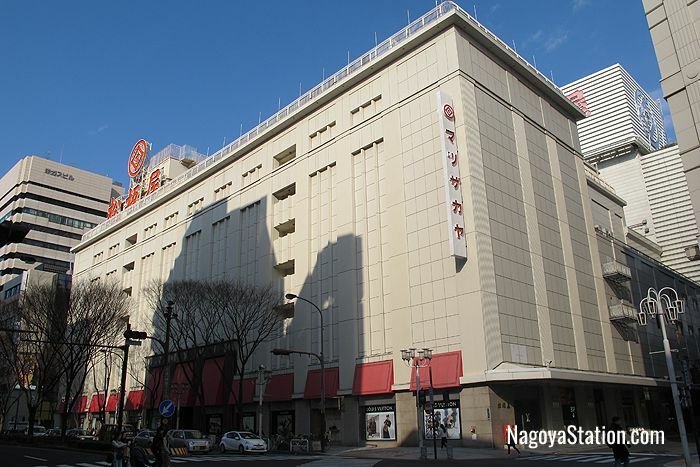 Today it is a major department store chain in Japan, and its Nagoya branch has the largest floor space of any department store in the country. There are actually three buildings which are connected by walkways at different levels: the Main Building and then a North Building and a South Building on either side of it. Men’s wear can be found in the north building, ladies’ wear, children’s wear, and household items in the Main Building, and young ladies’ fashions in the South Building. In the South Building there is also a branch of the Yodobashi Camera electronics store on the 4th – 6th floors, and an art museum on the 7th floor. The South Building also features an 11 meter high pipe organ which extends from the 1st floor through to the 4th floor and you can see this played on weekends and holidays. There are Tax Refund Counters on the 1st and 7th floors of the Main Building. This store is a 9 minute walk from Sakae Subway Station and a 5 minute walk from Yabacho Subway Station. 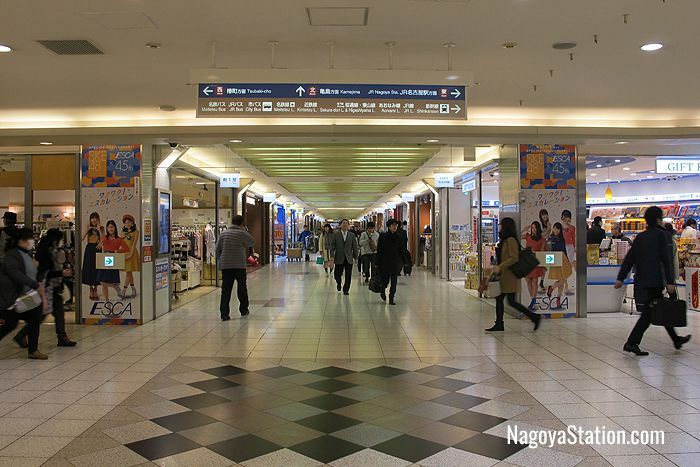 Right next to Osu Kannon Temple and the Osu Kannon Subway Station is a network of covered shopping arcades called Osu Shotengai. This area has been a thriving commercial district for over 400 years. Here you can find over a 1,200 shops, cafes, tea shops, ice cream parlors and restaurants. Wandering through the colorful arcades you can find all kinds of goods on sale: second hand clothes, textiles, electrical goods and appliances, handicrafts, souvenirs, old-fashioned candy stores, grocery shops, and household goods stores. The Osu district is a fun area to explore after sightseeing at Osu Kannon Temple and for sheer variety it can’t be beat! Opening Hours vary by each shop.